He was adopted and raised on a dairy farm. He was listed as being 35 years old in 2008 so his birth year must be around 1973. He successfully sought the Democratic-Farmer-Labor party endorsement to run for the 2nd Congressional District seat in the United States House of Representatives in the 2012 election. (He faced no primary opponent.) His opponent was Republican United States Representative John Kline. He lost the general election. 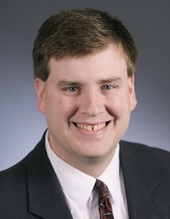 He was an unsuccessful candidate for the Minnesota House of Representatives in the 2006 elections. He was a member of St. Thomas Becket Catholic Church in Eagan, Minnesota. Cook, Mike. "Working to Unite, Obermueller Hopes to Represent by Connecting." Session Weekly, St. Paul: Minnesota House of Representatives Information Office, January 23, 2009, p. 16.